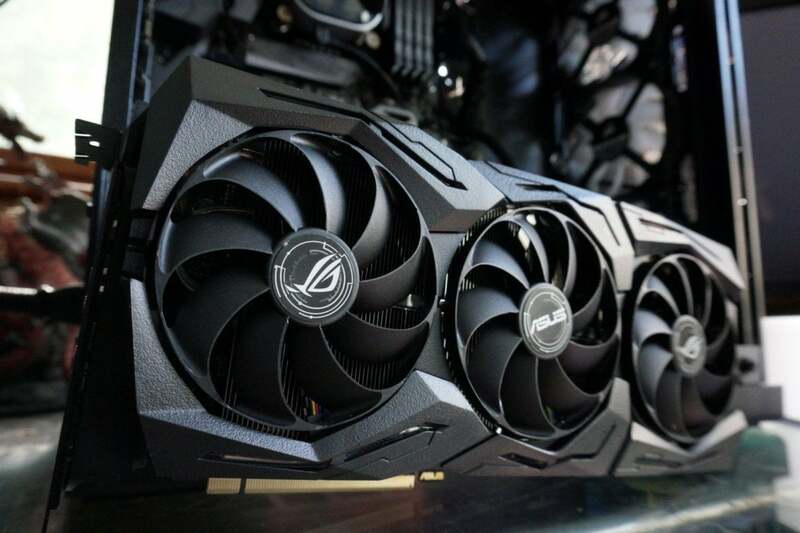 The hulking Asus ROG Strix GeForce RTX 2080 shows how Nvidia’s graphics card partners can still stand out from the crowd in an era when Nvidia’s making it harder than ever to shine. Last generation, all customized GTX 1080 Ti graphics cards plateaued at virtually the same level of performance. Custom cards were notably better than Nvidia’s own GTX 1080 Ti Founders Edition, though, because Founders Edition cards were restrained by reference clock speeds and a subpar single-fan, blower-style cooler. This generation, it’s looking like power limits will impose a new ceiling on GeForce RTX 2080 performance—but now, Nvidia’s vastly improved RTX Founders Edition cards pack a dual-fan cooler, a gorgeous design, and an 80MHz out-of-the-box overclock. Nvidia’s competing against its own partners something fierce. The ROG Strix RTX 2080 ($870 on NeweggRemove non-product link) fights back with heavy metal. Asus equipped the card with a massive heat sink, three fans, and extra features galore, giving the Strix RTX 2080 the ability to run incredibly cold—or virtually silent. The choice is yours. 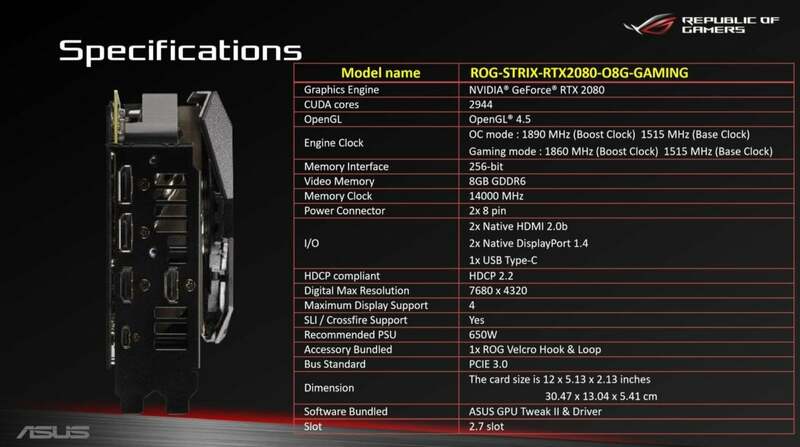 Let’s take a quick look at the ROG Strix 2080’s specifications. The raw specs aren’t very different from those of Nvidia’s GeForce RTX 2080 Founders Edition at their core. The ROG Strix RTX 2080 offers a higher factory overclock, at 1,860MHz compared to the FE’s 1800MHz. (The RTX 2080’s reference boost clock is 1,710MHz.) If you install Asus’s GPU Tweak II software, you’ll unlock another “OC Mode” that bumps up the clock to 1,890MHz. Memory sticks to stock speeds. Asus crammed an extra HDMI 2.0b port into the ROG Strix, bringing the card’s total to a pair of HDMI 2.0b ports and twin DisplayPort 1.4 connections. They’re joined by a VirtualLink USB-C connection for future virtual reality headsets. The card also features an upgraded power configuration for overclocking, requiring a pair of 8-pin power connectors compared to the Founders Edition’s 6-pin + 8-pin setup. 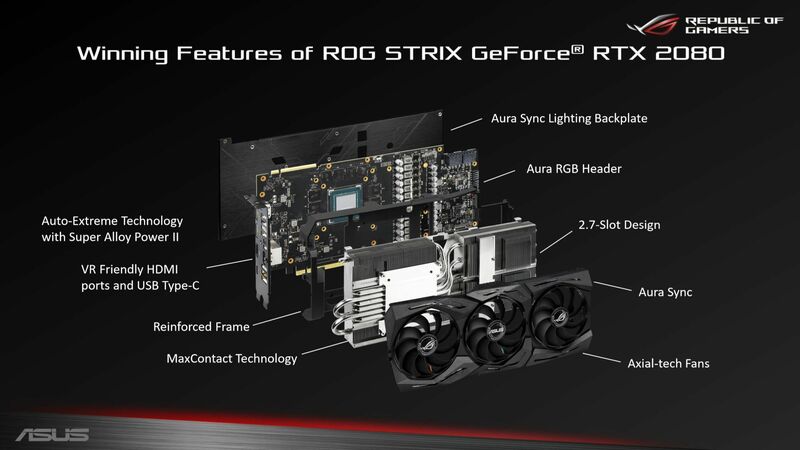 The ROG Strix RTX 2080 also includes the RT cores and tensor cores required to enable new and potentially amazing RTX graphics technologies, including ray tracing and Deep Learning Super Sampling. Our Turing GPU deep-dive explains how the new technologies work, but unfortunately, we can’t test them today. Ray tracing and DLSS aren’t currently enabled in any games, though Nvidia says the first ray traced games will show up sometime in October. But enough about the spec sheet. The fearsome cooler design and extra features make the Asus ROG Strix RTX 2080 special. The ROG Strix 2080 builds upon the success of last generation’s very impressive Strix design. This massive triple-slot graphics card measures a foot long and well over two inches thick, and it’s utterly bristling with fans, heat pipes, and a mammoth heat sink. The cooler’s so big that Asus reinforced it with a metal brace that runs the length of the card, mounted to both the backplate and the I/O shield, to prevent it from bending your PCB slot. Nobody likes GPU sag. The cooling starts with “MaxContact Technology,” a precision machining technique that Asus claims makes the heat spreader 10 times flatter than usual, resulting in twice as much surface contact with the graphics chip. That helps transfer more heat into the gargantuan aluminum heat sink, which has over 20 percent more surface area than its predecessor, Asus says. Three big axial-tech fans blow the heat out of the card. The Asus ROG Strix RTX 2080’s design. 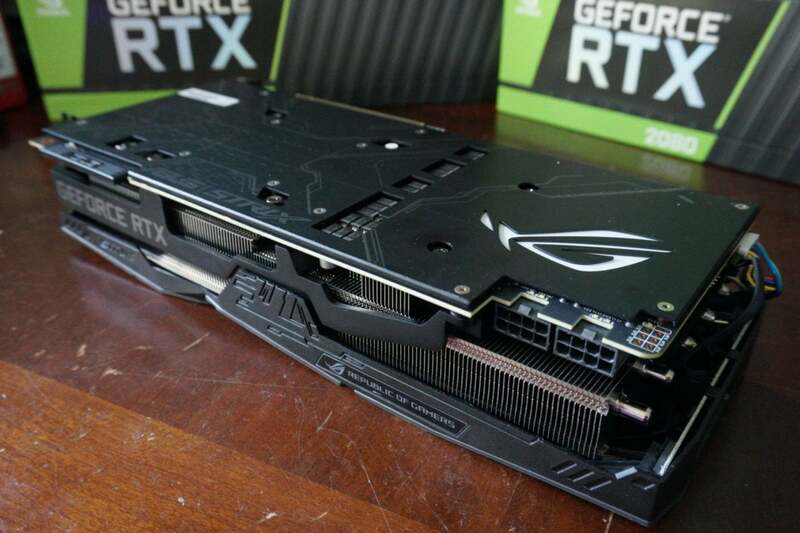 Asus loaded the ROG Strix RTX 2080 with dual BIOSes, which can be toggled via a small switch on the outer edge of the card, centered but underneath the card’s attractive backplate. By default, it’s flipped to the left for Performance mode; flipping it to the right activates Quiet mode. Performance mode optimizes for lower temperatures, so the fans always spin. Quiet mode optimizes for acoustics, so it has a much less aggressive fan curve, and the fans go idle if the GPU core temperature drops below 55 degrees Celsius. Both are tremendously effective at their given goals, as you’ll see in our benchmark results later. The precision-machined PCB features the 10+2 phase “Super Alloy Power II” power delivery system. Asus claims SAP II delivers better overclocking headroom, lower temperatures, more efficient power delivery, less electric buzzing, and enhanced long-term durability. The ROG Strix RTX 2080 comes laden with RGB LEDs, though you can disable them quickly by pressing a “Stealth Mode” button embedded in the card’s backplate. 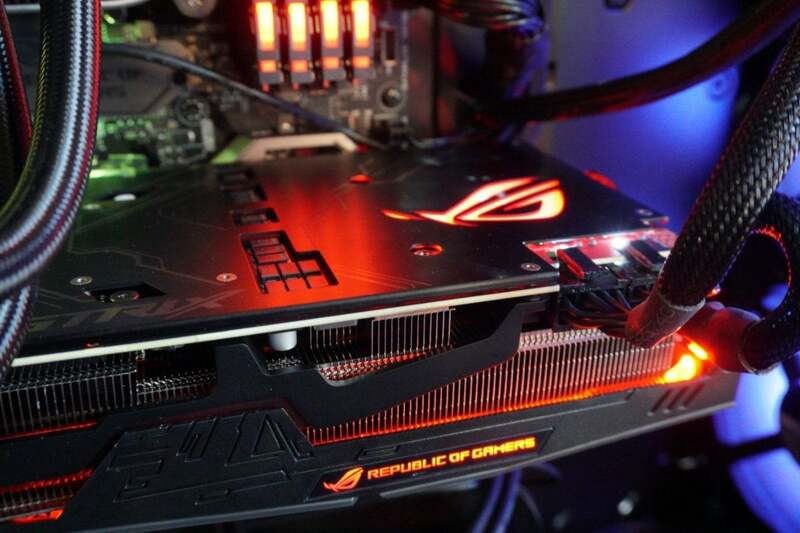 The ROG logo on the backplate and the “Republic of Gamers” text on the edge of the graphics card both light up, as do accents around the triple fans. A colorful glow emits from throughout the heatsink. It’s controlled via the Asus Aura Sync software, and you’ll find an Aura SYNC RGB header on the end of the graphics card, next to a pair of 4-pin fan headers. If you plug fans into these, they’ll be managed by the fan curves you set in the Asus GPU Tweak II software—handy if you point a fan directly at the Strix 2080. Bottom line: As a complete package, the Asus ROG Strix RTX 2080 is huge, impeccably manufactured, and just plain impressive. You could almost call it intimidating. Let’s see how it handles on the test bench.